Inside this Sanibel fifth wheel model 4101 you will enjoy the convenience of having a large master bath with dual sinks, and a half bath for your guests. The heated master bathroom includes a 48" shower with "Stor Mor" shower caddy, a walk-in closet, a dresser, linen storage, and a washer and dryer prepped space. When it's time to cook you will enjoy the large center island including a stainless steel sink with extra deep bowl, and a residential refrigerator, plus lots of floor space thanks to the dual slides in this room. You will find plenty of residential style seating, a king size I-Rest mattress in the walk-through bedroom, and much more to enjoy each time you take this model out! With any Prime Time Sanibel fifth wheel you will find sturdy construction and eye appeal inside and outside. From the exclusive Eternabond construction, Extreme Thermal package, E-Z Flex rubberized suspension, and Universal Docking Center features, you will enjoy a Sanibel fifth wheel for many years to come. 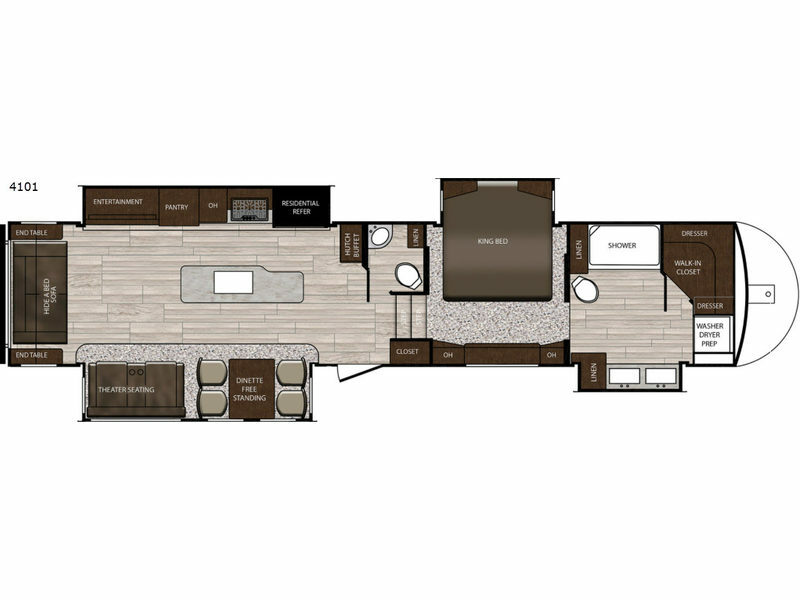 Inside you will find shaker style interior doors, solid surface countertops, dual quiet cool air conditioners, cherry hardwood cabinet doors and drawers, and the list continues with "must have" standard features in your next fifth wheel. It's time to hitch up and enjoy watching heads turn as you enter the campground in a Prime Time Sanibel. TV Info LR 50" LED, BR TV, Ext. Entertainment Ctr.